Reading 488-5, given in 1930 for a 19-year-old-male student of the Protestant persuasion, contains the only reference to Latinia in all of Cayce's readings. In the one before this we find in that land now known as Peruvian, the entity being among the Ohums [?] [Ohms ?] [Aymaras ?] of that period when there were changes being wrought in the land through the inflow of the peoples from Poseida and Latinia [? ], that southernmost portion of that land [Atlantis] sunk, and became a disperser of those forces as made for the applying of self in the building up of workers in precious stones and precious metals. These have more intrinsic value to the entity than many another condition in the entity's experience. In the name Ummmu. Note that someone, probably Gladys Davis, the stenographer for the reading, put the word “Atlantis” in brackets in reading 488-5 above. She probably did this when she was transcribing the reading from her dictation notes. I think, however, that her Atlantis guess is incorrect. An alternative explanation for “that southernmost portion of that land sunk,” is that Peruvian land referenced in line 1 of 488-5. This supposition is bolstered by the reference to “submerged areas of the southern portion as is now of Peru,” in 470-2 below. In the one before this we find in the days of the peoples coming from the waters in the submerged areas of the southern portion as is now of Peru, when the earth was divided, and the people began to inhabit the earth again. One entity among those who succeeded in gaining the higher grounds, and then in the name of (which was changed afterwards) Omrui, and changed to Mosases, for the entity became the ruler and the guide, or the patriarch of that age and gave much assistance to the few as was gathered about the entity. Fig. 1. Boundaries of the South American plate. Former southern Peru is assumed to have sunk in the vicinity of the letters “PCT.” PCT stands for the Peru-Chile Trench, The shaded area labeled S3 was a previous area of land in upper Paleozoic and Mesozoic times. Its boundary is diagrammatic, but is based on data regarded as reliable. The boundary is from Figure 10 of J. Dickins, 1994.1 The red star just off the coast of Peru denotes the site of archeological remains discussed later in the article. Clicking on the red star renders an enlarged view of the area. As mentioned in the next reading extract, there was apparently a fairly rapid submergence of part of the Peruvian land now sunk offshore. This sinking seems to have been gradual enough, however, to permit survivors to stream into Peru itself. In the one [incarnation] before this, we find in the now Peruvian country, when the people were destroyed in the submerging of the land. The entity then in that of the next to the ruler in the Ohlm rule. Approximately when did this portion of Peru/Lemuria, known as Latinia, begin to sink? The first temples that were erected [in Yucatan] by Iltar and his followers were destroyed at the period of change physically in the contours of the land. That now being found, and a portion already discovered that has laid in waste for many centuries, was then a combination of those peoples from Mu, Oz and Atlantis. Hence, these places partook of the earlier portions of that peoples called the Incal; though the Incals were themselves the successors of those of Oz, or Og, in the Peruvian land, and Mu in the southern portions of that now called California and Mexico and southern New Mexico in the United States. In the one [incarnation] before this we find in that day when there was the destruction to the elements of earth [Atlantis? ], then in now the PERUVIAN countries, when the lands disappeared in the low places and the entity was left alone in the higher mound to which the entity had then gone for its study. In the name then of Oumu. In the personality exhibited in the present, the ever fear in the deep recesses of self of destruction coming to many suddenly. Here we find a common thread between readings 470-2 and 182-2. The thread is the destruction to the elements of the Earth, when the Earth was divided. This division of the “Earth” seems to refer to the break-up of the Atlantean continent into five islands during the first destruction of Atlantis, some 19,400 years ago (364-11), and one assumes that destruction to remaining parts of Lemuria (or Mu) along the Pacific coast of South America, like Peru, took place then too. of Peru (Latinia) To Sink? The use of these influences by the Sons of Belial brought, then, the first of the upheavals; or the turning of the etheric rays' influence FROM the Sun – as used by the Sons of the law of One – into the facet for the activities of same - produced what we would call a volcanic upheaval; and the separating of the land into SEVERAL islands – five in number. "…[men on Atlantis] brought in the destructive forces as used for the peoples that were to be the rule, that combined with those natural resources of the gases, of the electrical forces, made in nature and natural form the first of the eruptions that awoke from the depth of the slow cooling Earth, and that portion [of Atlantis] now near what would be termed the Sargasso Sea first went into the depths." People Flee To Stable Portions of Peru? Figure 1 shows the decided bend in the coastline of western South America.” Why doesn't the coast from about 10ºS latitude trend along a more straight line as one's eye moves southward toward Chile? It's easy to postulate that it once did, but that something caused the southern part of former Peru to sink. That “something” is presumed, by combining relevant Cayce readings and geophysical conjecture, to have been a sudden movement of the Nazca plate as it pushed beneath the South American plate. This process, called subduction, may have submerged the southern part of Peru, or Latinia, in some fashion not yet documented by geologic studies. Note, however, that the process of subduction is being called into question in several places in the world where it was first proposed. This is discussed under a separate heading below. It may be that “vertical tectonics,” rather than the more horizontal subduction process was responsible for the submergence of Latinia. On October 29, 1965 the oceanographic ship R/V Anton Bruun was working off Callao, Peru in the Pacific Ocean over the Milne-Edwards Deep of the Peru-Chile Trench system. The research scientists aboard were taking bottom cores, dredge samples, and bottom photographs in water depths of 2000 m (6,560 ft). [Click on the red star on Fig. 1 to see a detail view of the R/V Bruun's location that day]. Fig. 2. 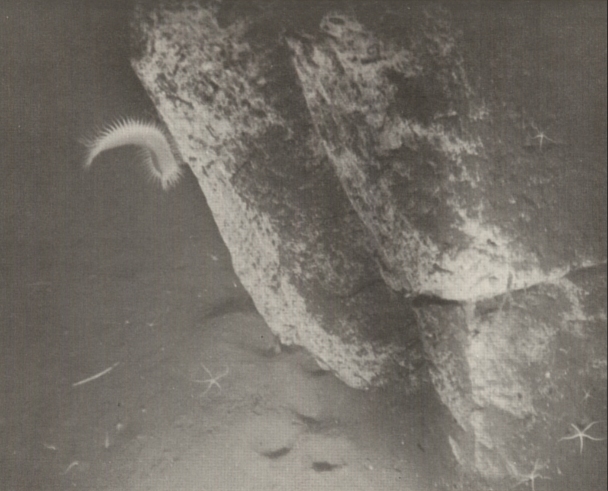 This is a copy of Figure 11 of the Cruise Report.2 The figure caption reads: “Photograph of the bottom at 2000 meters showing two columnar structures projecting from the sediments. Note the inscription resembling the figure 9, the large worm on the column, the long quill worm, and the numerous ophiuroids.” [Clicking on the image will show it at 2x scale (529Kb)]. Below find a copy of the text that accompanies the photograph of the columnar structures on the sea floor. 2. Columns under the Sea – or – Unusual Rock Formations Off Callao at a depth of 2000 meters (Sta. 158) some exceptionally interesting photographs were obtained. Figure 11 [our Fig. 2] shows two columnar structures projecting from the sediments. These were represented in only one exposure out of the 75-80 that were taken at. this station. This station was re-occupied in an attempt to obtain more clues regarding the origin of the structures. One exposure showed a block-like rock similarly exposed on the surface of the sediments and another showed what is possibly another buried columnar structure. It is tempting to suggest that these represent evidence of submerged man-made structures. The apparent "inscriptions" on the columns is suggestive as is also their upright condition. The absence of typical submerged rock exposure is further suggestive that these photographs have recorded more than just sedimentary rock exposures. The possibility certainly exists, even if the probability is low, that these photographs do show evidence of submerged man-made structures. Whether they were dropped into the sea or gradually submerged remains to be determined. haven't been able to find any later reports confirming or refuting this discovery, and it is hard to tell whether it was ever taken seriously by scientists. It was certainly made by a respectable researcher. As one who was a practicing marine geologist at one time in his career, I can say that the features in Figure 2 certainly look more like man-made columns than natural rock formations of the sea floor. As for the purported “inscriptions,” however, I'd rather not render an opinion until somebody can supply me with a glossy print of the original negative. The clarity of the figure in the cruise report is just too poor to be of much use. Subducted By The Nazca Plate? Not every practicing Earth scientist believes that the case for subduction zones is airtight and applies everywhere in the oceans. The following extract is from a paper by D. Pratt that appeared in New Concepts in Global Tectonics Newsletter, no. 21, p. 10-24, December, 201. [I have done some light editing to reduce jargon and render the prose more understandable for laypersons. Full citations to the works of others are to be found in Pratt's paper]. Ocean trenches were initially expected to contain thick, deformed sediment accumulated during millions of years of convergence. Instead, 44% of trenches are empty of sediments. The rest do contain "accretionary wedges" along the landward slope, but smaller than expected. Accretionary wedges were expected to grow and uplift with time, but it is now known that some have subsided several kilometers. Moreover, the sediment in them is usually horizontally layered and undisturbed, and is mainly derived from the land rather than being off scraped oceanic sediment. Plate tectonics enthusiasts have had to resort to the far-fetched notion that soft ocean sediment can slide smoothly into a subduction zone without leaving any significant trace. The finding of old sedimentary rocks along the inner trench slope has led to the belief that younger rocks from the continental margin must have been eroded and subducted as well. Off scraped seamounts and seamount fragments should also be piled up in ocean trenches, but they are not. The original prediction that subduction zones would show abundant and obvious compressional features has also proven false. Extension is ubiquitous on the oceanward trench slopes. The trench itself has the cross-sectional appearance of a depressed crustal unit. Extension even predominates on the middle and upper parts of the landward slope. Compression is now relegated to the lower trench slope, but this area is better interpreted as the toe of a large slump or debris flow. Choi (2000) argues that plate-tectonic interpretations of seismic profiles across Pacific trenches lack geological integrity and are clearly model driven. Several profiles appear to show that the Precambrian lower crust is present under both the ocean floor and continental slope and passes across the trench without any subduction. Landward-building sediments, together with geophysical and dredging data, indicate that continental landmasses once existed in the present Pacific where there are now deep abyssal plains and trenches. [See S3 in Figure 1 above]. Depictions of subduction zones in textbooks on plate tectonics are highly stylized. Subduction zones actually have a highly variable and complex structure, with transverse as well as vertical discontinuities and segmentation. They frequently consist of two separate sections: the upper segment tends to have a shallower dip than the lower segment, and the two sections may be offset by up to 350 km. Deep earthquakes are disconnected from shallow ones and there are very few intermediate earthquakes (see figure below). The very low level of seismicity within about 50 km of the trench axis, and the lack of a large thrust fault at the base of the continental slope contradict the alleged presence of a downgoing slab. Earthquake distribution [in the plane of a hypothetical subduction zone] perpendicular to the Andes (earthquake foci within 15-30°S are projected onto the plane). The outlined "subduction zone" appears to be based largely on wishful thinking. [Adapted from the corresponding figure in Pratt's article]. Most large earthquake foci are believed to occur at the plate interface in a Wadati-Benioff zone, but deep and intermediate quakes occasionally occur well outside this zone. It is puzzling that many earthquakes occur within the "subducting slab" rather than along the plate interface, where the stress is supposed to be highest. Another disconcerting development for the plate tectonics theory is that the slip motion of earthquakes rarely occurs in the direction of the dip of the Wadati-Benioff zone; it is commonly oblique to the "subduction" plane (Oard, 2000b; Suzuki, 2001b). The magnitude 8.3, deep-focus earthquake in Bolivia in 1994 appeared to slip on a horizontal plane cutting across and through the supposed steeply dipping subduction slab. At the present time, most geologists believe that the Peruvian coastal crust of South America reflects general uplift, as determined by studies of terraced surfaces of sea level erosion. Also, local changes of sea level often occur before major earthquakes in coastal Peru. M. Wyss found4 that earthquakes of M 7.6 and 7.8 in northern Peru followed an uplift of 5 cm. ….lands will appear in the Atlantic as well as the Pacific. And what is the coastline now of many a land will be the bed of the ocean. Earthquakes and tsunamis will devastate the coastal areas of Peru in response to pole-shift-induced motions of the abutting Nasca and South American plates. This eventuality is spoken of in reading 270-35, which speaks of inundations by earthquakes in response to greater activities in Vesuvius or Pelee. The USGS link to the magnitude 8.4 earthquake near the coast of Peru on June 23 2001 and NOAA's animated graphic showing the effects of the 2001 tsunami off of Peru reveal the potential severity of such tectonic events, which are almost common to this part of Peru today. The giant (M 9.0) earthquake and tsunami of 1868, described in the USGS bulletin below, thus suggest Earth changes to come for Peru. From the United States Geological Survey, National Earthquake Information Center: A major earthquake occurred NEAR THE COAST OF SOUTHERN PERU, about 110 miles (175 km) west of Arequipa or about 370 miles (595 km) southeast of Lima at 4:33 PM EDT on Jun 23, 2001 (3:33 PM local time in Peru). A REVISED magnitude of 8.4 was computed for this earthquake. Several moderate aftershocks have been recorded, the largest having a magnitude of 6.8. The focal depth was shallow, although an exact depth is problematic. This is because such a large area of the plate interface ruptured, making it difficult to assign a meaningful depth. At least 102 people killed, 1,368 injured and extensive damage in the Arequipa-Camana-Moquega-Tacna areas. At least 20 people killed and some missing from a tsunami in the Camana-Chala area. plate-boundary segment that produced an earthquake of magnitude approximately 9.0 in 1868. The 1868 earthquake was destructive in towns that were heavily damaged in the June 23 earthquake. The 1868 earthquake produced a tsunami that killed hundreds of people along the South American coast. The 1868 tsunami also caused damage in Hawaii and alarm in Japan. Whether or not the Naza Plate subducts the South American plate, or whether primarily vertical movements are occurring deep below the coastal zone of Ecuador, Peru, and Chile, extensive seismic activity is expected to continue throughout the western South American plate before, during, and after any pole shift. Many future earthquakes will be severe, as they have been in the past. This is not the terror felt by someone running from a furious bull, a threatening knife….This is a cosmic terror, an instant danger, the universe caving in and crumbling away. And, meanwhile, the earth lets out a muffled sound of thunder, in a voice no one knew it had. The dust raised by the houses as they came crashing down settles little by little. And we are left, with all the dead, not knowing how we happen to be still alive. Some 75,000 people perished in the quake as it shattered town after town in a long narrow valley known as the Callejon de Huaylas. This was by far the worst natural disaster in the history of the Western Hemisphere. Dickens's article is entitled, “What is Pangea?” in “Pangea: Global Environments and Resources,” Canadian Society of Petroleum Geologists, Memoir 17, pp. 67-80. We obtained one of only five copies in the world, via interlibrary loan from the Texas A and M, Marine Laboratory, in Galveston (OCLC #33371904). It is titled, “Cruise Report, Research Vessel Anton Bruun, Cruise 11.” And is authored by R. Menzies, Duke university marine laboratory, and Edward Chin, of Texas A and M University's Marine Laboratory. 1997, St. Martin's Paperbacks, page 111. Wyss, M., 1976, Local changes in sea level before large earthquakes in South America, Bull. Seismological Soc. Amer., v. 66, pp. 903-914.